Our first day in Paris was great! 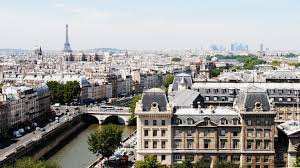 The flight went smoothly and when we arrived to Charles de Gaulle Airport, we were met by a driver who took us to our hotel which is located in the trendy, artsy Montmartre neighborhood. The hotel is named after a famous painter, Andre Gill, whose work we saw during our walking tour of the area. 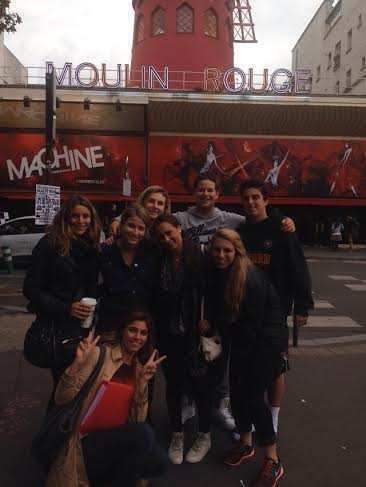 Also on our tour, we also saw the famous Moulin Rouge which is of course best known as the birthplace of the modern form of the can-can dance. As we explored the area, our guide shared with us many stories of the places we visited, pointing out to us the places where Picasso used to hang out and painted his first Cubist painting, where Van Gogh painted many of his works, and where to get the best crepes in town! 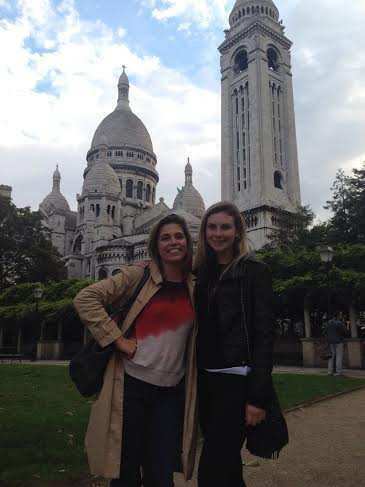 On our tour of the neighborhood, we also saw the famous Basilica of the Sacred Heart of Paris, commonly known as Sacré-Cœur. This Roman Catholic church which was built in the late-1800’s to early 1900’s, is a popular landmark, which is set at the highest point in the city of Paris. Sacré-Cœur is a viewed by the French as a double monument, both political and cultural, as well as a place of worship. 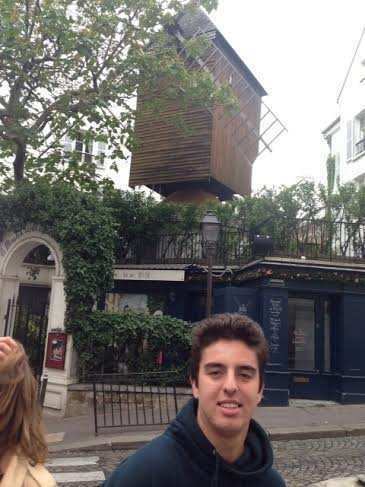 Everyone also enjoyed seeing the Moulin de la Galette – a windmill right in the Montmartre district. Once a functioning mill (built in the 17th century), this site also hosted a restaurant and became a popular place to visit for a glass of wine and bread from the mill. Artists, such as Renoir, Van Gogh, and Pissarro have also painted the Le Moulin de la Galette. Despite a little bit of rain during the day, the group had a great time beginning to explore the city. In the evening, everyone headed out to the Eiffel Tower. Did you know that the tower is actually named for the engineer who designed and built it? The tower was originally set up as the entrance arch to the 1889 World’s Fair and was initially criticized by some of France’s leading artists and intellectuals for its design, but as we all know it has become a global icon of France. And, it is the most-visited monument in the world. The day started out with a tour of the Jewish district guided by a hip guide who showed the group the ins and outs of the area. 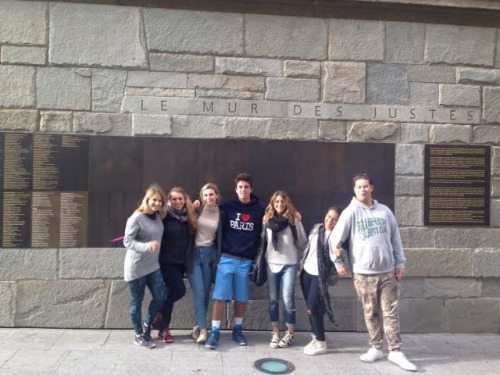 As the group walked through the Marais district, they learned about the history of the French Jewish community from the time of the French revolution through today, touching on the emancipation of the Jews, The Dreyfus Affair, World War II and more. In addition they heard about many of the successful Jewish families of France over history who made their marks on business, the arts, and more. Some of the sites the group visited were the Shoah Memorial which pays tribute to the 72,000 Jews who died at the hands of the Germans during the occupation of France during WWII, many synagogues, yeshivas, and shops. Many of the street names also are indicators of the community that lived in this area on and off for over 800 years. One of the sites which the students really appreciated seeing was the Memorial to Righteous Gentiles. They also enjoyed seeing that there were both Sephardic and Ashkenazi restaurants offering the cuisine of both cultures. Of course, it was the bakeries that made the biggest impression on the students’ taste buds! For lunch, the group headed over to the Centre Georges Pompidou which houses a modern art museum and is a fascinating architectural structure. The group really enjoyed eating at an authentic Parisian café overlooking the wild, high-tech architecture of Pompidou. Next everyone was ready for some free time to get a little shopping in. And speaking of shopping, later in the afternoon, it was off to Galleries Lafayette – one of the most famous and beautiful department stores you will find. Before hitting the racks though, the group sat back to enjoy a little fashion show. Julia and Megan even had a chance to strut their stuff down the runway. Heading into Shabbat, the group made their way back to the hotel and had Kiddush and made HaMotzei together in private before going to dinner. 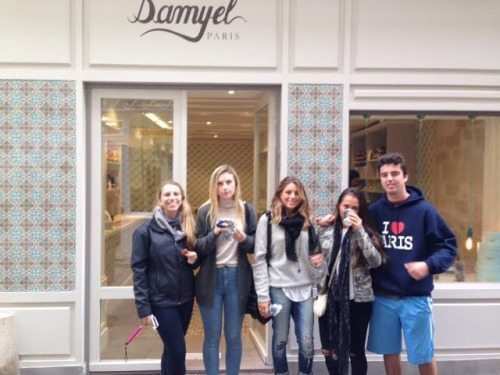 We should mention that due to the rise in anti-Semitism in the past year in France, we made a conscious decision not to spend Shabbat in the Jewish area of Paris and the students were instructed not to bring or wear anything that would identify them as Jewish such as a star necklace. 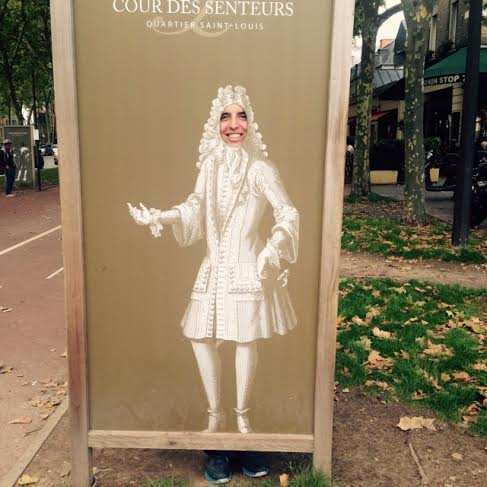 Millions of tourists visit Paris every year without incident, but we didn’t want to take any chances. Although the weather has been a bit rainy, everyone is having a great time and is looking forward to all that’s still to come – the Louvre, Versailles, and more! Today was a wonderfully relaxed day which brought the students the best of French culture. In the morning, the group walked to the Louvre and had plenty of time to explore this expansive museum at their own pace. If you’ve ever been to Paris, you know that the Mona Lisa is one of the most famous pieces at the Louvre and it’s surprisingly small. Nevertheless, it’s an amazing experience to actually see her hanging on the wall instead of featured in a book or on tv. And of course, everyone enjoyed seeing the modern pyramid which marks the entrance to the Louvre as well. 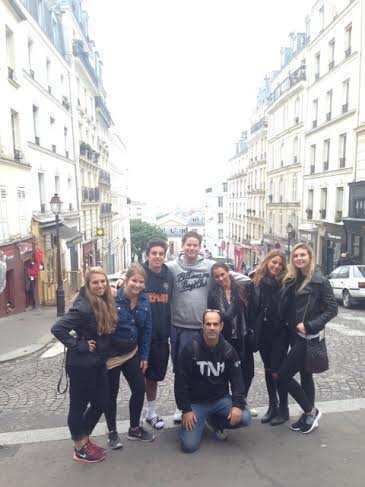 Following the museum, the group made a stop to eat classic French baguettes at a famous bakery nearby and they explored the Tuileries Gardens which are located adjacent to the Louvre. 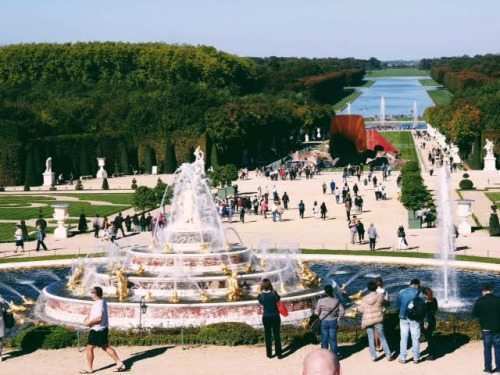 Established as the garden of the Tuileries Palace in 1564, it was eventually opened to the public in 1667, and became a public park after the French Revolution. In the last two centuries, it has ben a popular place for Parisians to relax and meet. The group also enjoyed seeing the River Seine and crossing over several of its bridges including the famous Pont des Arts. Walking through the city throughout the day gave the students an opportunity to also get a feel for things. They had time to stop in places that looked interesting and to people watch a bit as well. All in all, it was a great day! 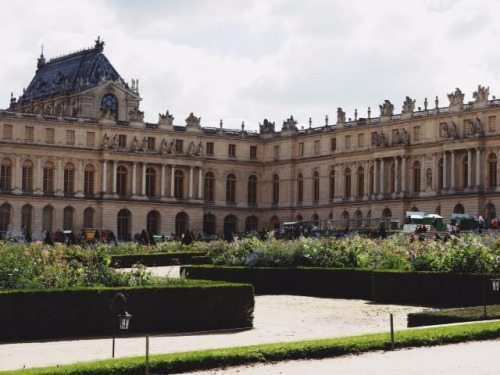 Today the group traveled to Versailles for a tour back in time to the Kings and Queens of the 17th and 18th centuries. 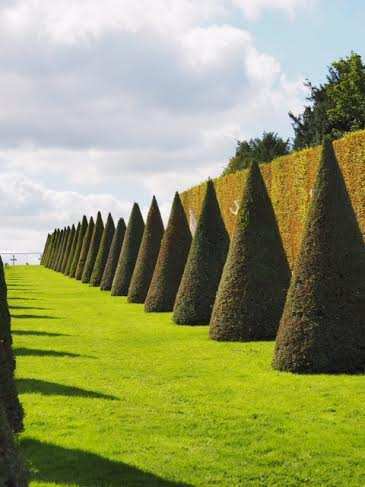 The palace and gardens in Versailles are world famous for their extravagance and beauty. As the group toured Versailles, their guide shared stories and history with them, taught them how the royal court were expected to behave (including how to walk properly) and filled everyone in on some of the scandals of French royal history as well. Everyone really enjoyed the fountains and Kobi was particularly good at playing the role of a royal subject. Back in Paris, the next stop was the Notre Dame Cathedral. Unfortunately, there were no sightings of the hunchback, but everyone did get to see the gargoyles. Perhaps the most fun part of the day was heading back to the Jewish area of town and having dinner at a really cool, kosher restaurant called Miznon. The students noticed that many non-Jews also dined at the restaurant (which is pretty uncommon for kosher restaurants throughout the world.) The area is really a popular one today and the food at the restaurant was excellent. 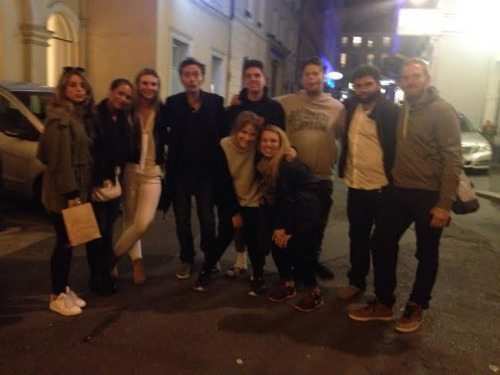 But, the reason the meal was so nice was that the group was joined by a number of young French Jewish students who came to share their perspective on growing up Jewish in France. It was great for the Aardvark students to hear from people their own age and to connect over shared values like Israel. 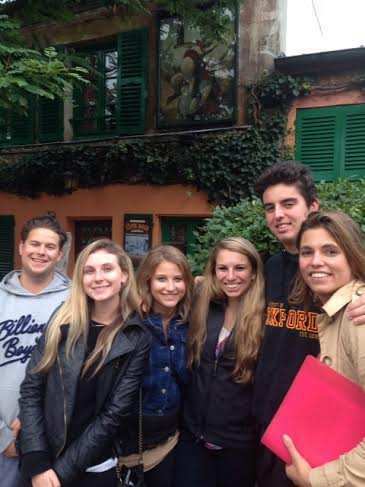 After dinner, the French students took the Aardvark students out to one of their favorite dance places. The day started out with a visit to the Arc de Triomphe one of the most famous monuments in Paris. The Arc de Triomphe honors those who fought and died for France in the French Revolutionary and the Napoleonic Wars, with the names of all French victories and generals inscribed on its inner and outer surfaces. Beneath its vault lies the Tomb of the Unknown Soldier from World War I. The views from the top of the Arc de Triomphe allow you to see a 360 degree view of the whole city and the students especially enjoyed the view of the Eiffel Tower from the top (see photo attached)! 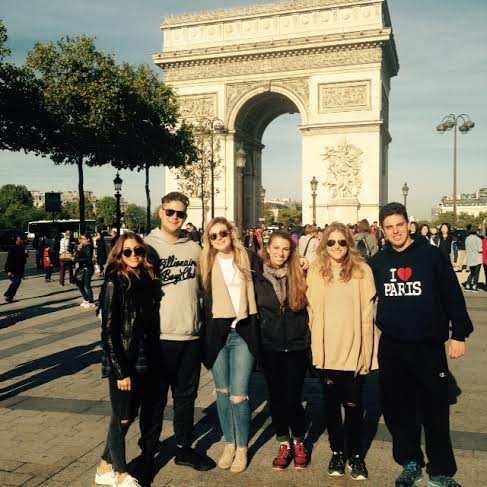 The Arc is located at one end of the Champs Elysees which was the next stop on the trip. The Champs Elysees is perhaps the most famous street in Paris and is the location of all the most popular flagship stores. 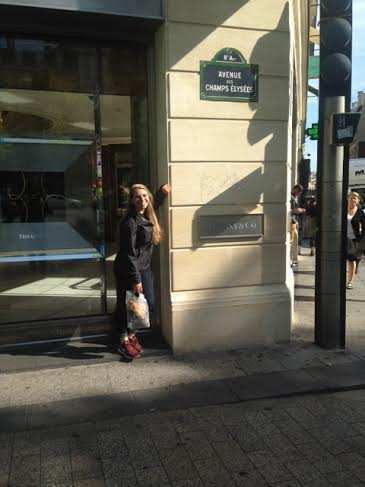 Strolling down the Champs Elysees was a lot of fun and the students enjoyed window shopping (and some actual shopping…) The weather was great and everyone had a great time exploring this area. 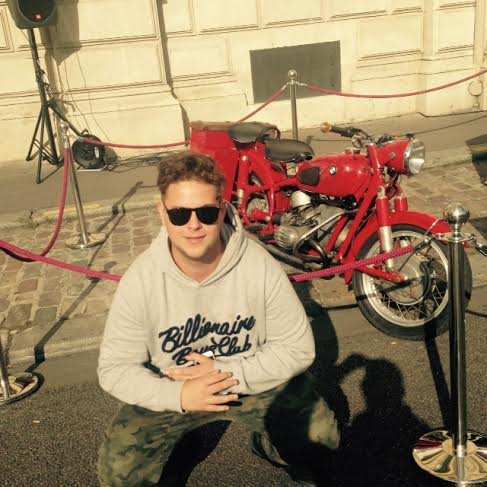 Particularly Dylan who impressed us with his knowledge of European cars. For lunch the group ate at a kosher restaurant called Kavod which is located just around the corner from the Israeli Embassy. 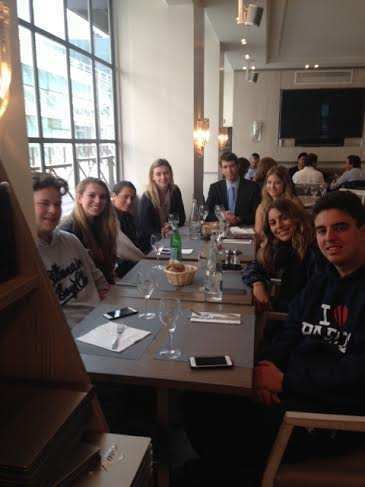 Joining the group for lunch was Ido Bromberg, the Director of Public Relations of the Israeli Embassy to France. As the students dined on foie gras, duck, and other French delicacies, they discussed the perception of the French towards Israel and the challenge of anti-Semitism in France today. Alena was particularly interested in the discussion with the Embassy official. Perhaps she will herself wind up in the Foreign Service in the future. In the afternoon, everyone enjoyed a relaxing stroll through the Tuileries Gardens and the chance to explore other areas of these huge gardens. In addition, the students had free time to pick up the last souvenirs. And, everyone made a visit to the famous Laduree Bakery and enjoyed tasting the special French macaroons. The evening brought a chance to celebrate. Not only was it a great trip, but it was also Megan’s birthday! Everyone enjoyed the special café at which the celebration took place, especially Jade who helped everyone appreciate the cool café culture. Happy birthday Megan! 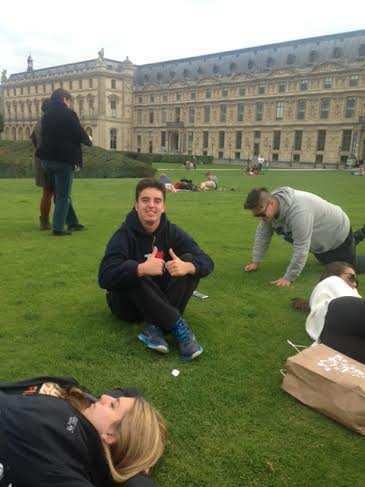 As the first of eight trips on the Aardvark International Program, the last evening in Paris marked the first installment of the exciting game of Aardvark Top Traveler (not to be confused with the Amazing Race on TV…) Although each of the students were worthy competitors, two students truly stood out. It all came down to Kobi and Julia. Kobi was really helpful throughout the trip in keeping everyone together and participated in everything with a smile. Julia was energetic and motivated to get everything possible out of the trip. The competition was steep, but ultimately, Julia came out ahead for organizing an opportunity to go tango dancing which is popular now in Paris. 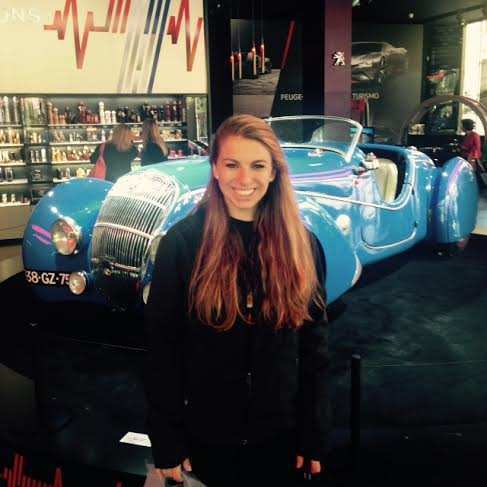 Congratulations to Julia for coming in first in the France segment of Aardvark’s Top Tourist! !